This hearty soup was inspired by Martha Stewart, who insists that the best type of mushroom for this soup is borovik since that’s what her Polish mother always used, and which we should always “remember is very expensive”. Oh well, I couldn’t possibly forget that, and settled for a combination of crimini and dried porcini. I would not recommend skipping on the porcini. It sounds like one extra step to do, but it isn’t complicated and makes the soup, in my opinion. Russian wood bowls are optional. * To make it gluten-free, substitute your favorite kind of rice for the barley, and replace flour with 1 tb of corn starch. In a small pot, cover the mushrooms with 2 cups of water, bring to a boil, reduce heat to low and simmer for 5 minutes. Remove from the burner and let cool. Strain the mushrooms through a sieve, reserve the liquid. Rinse the mushrooms under the cold water to remove sand, coarsely chop and set aside. Bring 2 cups of water to a boil, add barley, reduce heat and simmer for 10-12 minutes. Set aside. In a medium soup pot brown crimini mushrooms on medium high heat for 5-7 minutes. Add the carrots, celery, onion, herbs if using. Add the stock and bring everything to a boil. Cook for about 10 minutes on medium-low heat, until the vegetables are tender. Add the cooked barley, mushrooms and their liquid (leave the last few tablespoons of the liquid in the bowl– there still may be some sand left at the bottom). Season with salt and pepper. In a small bowl, stir together the sour cream and the flour. While stirring, slowly add 1 cup of cold stock or water. Stir into soup. Bring everything to a boil and let it thicken. What is your favorite way to cook mushrooms? We love mushrooms, I am always on a look out for new recipes and ideas! 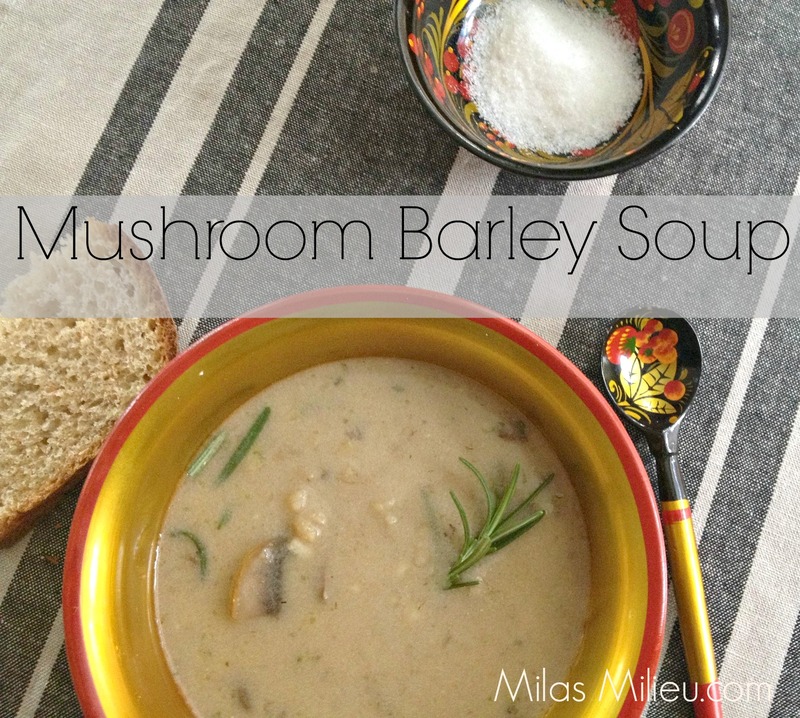 My mom made a great mushroom barley soup (a recipe no doubt handed down from her Russian mother and aunt), but it is different than this one. I’m going to pin this – it looks delicious, Mila! Thanks Amy! I didn’t know your grandmother was Russian. I am sure your mom’s version was great. There is something homey about mushroom+barley combo. I also like that it is relatively low-calorie. The sour cream can be easily left out.